The double crosses pile up in this comedic thriller starring Simon Pegg as a jaded hit man on a seemingly routine job. The assassin finds himself in the center of three tales of murder, mayhem, blackmail and revenge intertwine when a gambling addict, a small town "Lady Macbeth," a club owner, a policeman and a lover all converge on the same mark. Can a movie skirt critical disaster based on the undeniable allure of a silly mustache alone? Well, maybe not alone, but it can certainly help. A lot. Derivative yet marked by just enough personality to avoid complete mediocrity, 'Kill Me Three Times' attempts to bring a few playful twists to the tried-and-true crime genre. Unfortunately, outside of Simon Pegg's amusing whiskers, these cinematic spins really aren't very original, leading to a familiar but still worthwhile pulp thriller. We may have seen this exact kind of story before -- but this time it features a man with ridiculous facial hair! Now, who says the movie industry is out of ideas? When a jealous husband (Callan Mulvey) discovers that his wife (Alice Braga) is cheating on him, he hires a professional hit-man, Charlie Wolfe (Simon Pegg), to murder her. But when Wolfe attempts to go through with the assignment, he discovers that another party may already be doing his job for him. As new twists and turns are revealed, the once simple assassination becomes increasingly complicated, exposing a slew of greedy motivations that threaten to leave a growing trail of bodies in their wake. Structured into three distinct parts, the script jumps around in time and perspective. The first act primarily focuses on the middle of the plot, while the second act largely flashes back to the beginning of the story, and the third act concludes the timeline. This little bit of narrative flash is nothing new, but the mixed-up chronology works as intended, allowing plot twists to unravel as previously unknown information is revealed, adding extra layers to scenes that have already passed. Likewise, the filmmakers maintain a brisk pace throughout the winding runtime, and balance the film's darkly comedic tone fairly well. Mixing comedy and bloodshed, the movie offers some solid thrills and uncomfortable laughs. As the initially unexpected murder plot unravels, the amateur culprits give off a slightly bumbling quality, and their back and forth squabbling amidst their deadly actions is amusing. At the same time, the flick certainly does not shy away from carnage, resulting in some rather bloody violence and deaths that manage to maintain a humorous spin thanks to a faintly cartoonish style. A few splashy visual flourishes are thrown in here and there as well, including lots of striking aerial footage of the Australian beach locals, and some dramatic slow motion shots that heighten key moments. 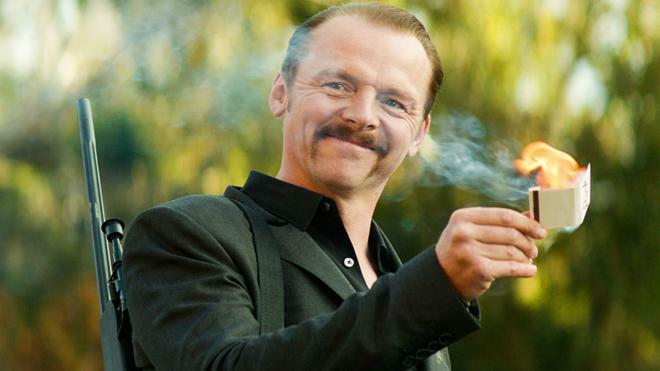 Serving as our main vantage point into the story, Simon Pegg's Charlie Wolfe proves to be a fairly fun character. With his horseshoe mustache and goofy smile, there are times when the killer seems like he just walked out of an entirely different movie, but this disconnect actually works well with the film's pulpy tone. And though the man might seem like a joke on the outside, he quickly cements himself as a legitimate threat (minus a few mishaps here and there). The rest of the cast is also very effective, making the most out of their stock character roles -- especially Teresa Palmer who seems to relish every moment of her Lady Macbeth-like turn as Lucy. Also, I'd certainly be remiss if I didn't mention the inclusion of Luke Hemsworth. Yes, that's right, there's a third Hemsworth brother. Not Chris. Not Liam. Luke. And though he might be the Stephen Baldwin of the Hemsworth clan, he's still a solid performer. Talented cast aside, 'Kill Me Three Times' is not without some notable problems. At the end of the day, none of the characters are very developed. Instead, they're simply pulp genre archetypes playing out standard pulp genre plot threads. There's an abusive husband, a cheating wife, a desperate gambler, a greedy femme fatale, a corrupt cop, a deadly killer, and a twisting scheme that involves -- yes, you guessed it -- insurance fraud! Though some great flicks have resulted from ingredients like this in the past, the script never really does anything particularly interesting with them. Sure, it's clear that the filmmakers have a lot of cheeky admiration for all of these cliches and conventions, but this genre love never evolves into the kind of cinematic creativity found in similar efforts from directors like the Coen Brothers and Quentin Tarantino. Not bad. That's the general thought I had after finishing 'Kill Me Three Times.' Not particularly good, and definitely far from great -- but not bad. While that might sound like pretty faint praise, that's probably because... well, it is faint praise. And that's about all this flick deserves. There's a decent twist or two, but the script and direction aren't as clever as they need to be, leading to a mostly basic crime thriller that tries to dress up its deficiencies with a jumbled structure and a dumb mustache... and it almost gets away with it. Magnolia brings 'Kill Me Three Times' to Blu-ray on a single BD-50 disc that comes housed inside a keepcase with a cardboard slipcover. After some skippable trailers, the disc transitions to a traditional menu screen. The packaging indicates the release is Region A coded. The movie is provided with a 1080p/AVC MPEG-4 transfer in the 2.39:1 aspect ratio. Sharp and colorful, this is a very impressive image free from any major flaws. The source is clean and crisp with no signs of troublesome noise. Clarity is exceptional throughout, offering sharp fine details and textures. Wide aerial shots of the ocean and beach locals are especially striking, and the waters shimmer nicely off the screen. The color palette features richly saturated primaries with bold reds, blues, and greens that pop from the screen. With that said, contrast is rather blown out at times, leading to a slightly washed out look in whites during bright sequences. Thankfully, blacks are deep and inky without crushing. Though artifacts are essentially absent, there is a hint of aliasing and contouring in a shot or two. With often gorgeous color and impeccable detail, 'Kill Me Three Times' looks fantastic on Blu-ray. The faintly cartoonish visual style works well with the tone, and the transfer is technically proficient. The film is presented with an English DTS-HD MA 5.1 track along with English SDH and Spanish subtitles. Though not demo worthy, the mix bolsters the content well, adding some nice kick and lively personality to the proceedings. Dialogue is clear and well prioritized with no balance issues to report. The soundstage is relatively immersive, with a solid sense of general atmosphere and surround use (birds chirping, crashing waves, blowing wind), helping to enhance the beach town ambiance. Directionality is also good, spreading appropriate panning effects between speakers as characters and cars move about the screen. Likewise, the movie's livelier moments offer a nice jolt, lending gunshots and explosions a hefty punch. Dynamic range is also wide and distortion free, and the film's playful score comes through well with pleasing fidelity and separation. For a fairly low budget crime flick, the audio here sounds quite good. The sound design isn't as enveloping as more robust tracks, but it's effective all the same. Magnolia has provided a solid assortment of supplements, including two commentaries. All of the special features are presented in 1080p with Dolby Digital 2.0 sound. Commentary with Director Kriv Stenders and Cinematographer Geoffrey Simpson – Stenders and Simpson sit down for a steady and informative discussion about the movie. The pair focuses on the film's shots and visual style, but also address a wealth of production trivia including details on casting, editing, influences, storyboards, deleted material, locations, and scheduling. Filled with interesting movie-making tidbits, this is a great listen for budding filmmakers. Commentary with Director Kriv Stenders and Producers Tania Chambers, Laurence Malkin, and Share Stallings – For the second commentary, Stenders is now joined by a trio of producers. Though a lot of the same ground is covered here, the participants expand upon topics already broached and offer some more details about the film's shoot. Though I'm not sure that two commentaries were really necessary, fans might want to take a listen. Deleted Scene (HD, 3 min) – A single deleted scene featuring a musical performance by Alice is included. This is a strong sequence but might be a little too on the nose. The Making of Kill Me Three Times (HD, 18 min) – This is an informative behind-the-scenes doc that features cast & crew interviews. The casting, characters, visuals, and script are all addressed along with several worthwhile production insights. Q&A (HD, 14 min) – Recorded in 2014 at the BFI London Film Festival, this Q&A features actor Simon Pegg and the film's producers. The group discus how they accommodated Pegg's limited schedule, the movie's inspirations, and the drawbacks to a horseshoe mustache. Storyboards (HD, 5 min) – This is a reel of storyboards for several important scenes set to music. Behind the Scenes Photo Gallery – Here we get a collection of on-set photos. Poster Gallery - A gallery of character posters from the film is included. 'Kill Me Three Times' is a familiar but still worthwhile pulp crime thriller. Though the plot and characters are pretty basic, the cast and darkly comedic tone are entertaining. On the technical front, the disc's video and audio are both strong. Magnolia has also provided a nice assortment of supplements, including two commentaries and a behind-the-scenes featurette. The movie doesn't break any new ground, but this is still a loving little genre flick that might appeal to big fans of similar efforts. Worth a look.